Every week I buy a bag of obscenely expensive granola from the grocery store. And every afternoon when my stomach begins to grumble, anabolics I have a some plain Greek yogurt with a good sprinkling of granola. It’s just the right amount of sweet, asthma filling and crunchy for the afternoon and I’ve become completely addicted. So, when I saw this recipe in the New York Times for Olive Oil Granola, I thought I’d give it try. I’ve been meaning to make my own granola for a long time and just never got around to it. And now I’m wondering what the hell took me so long! 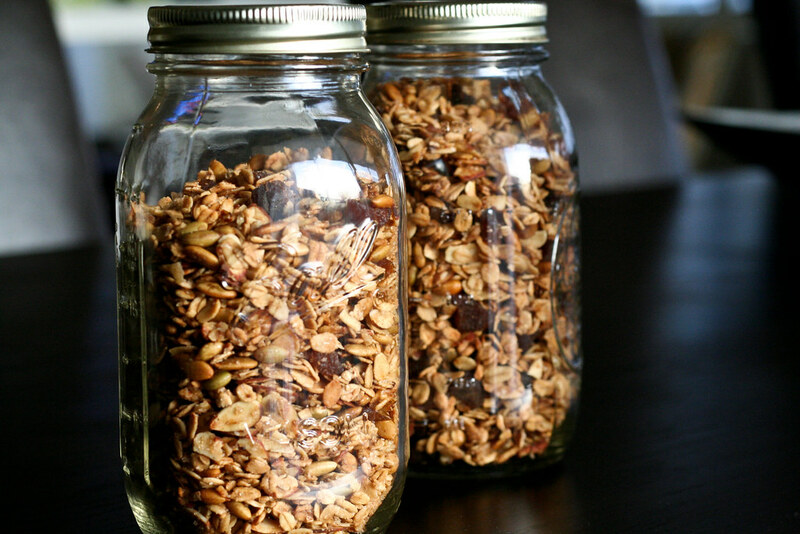 Homemade granola is amazing and probably half the price of that fancy stuff I buy. I used slivered almonds and salted pumpkin seeds along with ginger-spiked sugar, cinnamon and cardamom. The olive oil gave everything a rich lushness and I was able to achieve a much more pleasant salty/sweet ratio than the over-sweetened stuff I buy. I am absolutely obsessed with it. In fact, I’m having a really hard time stopping myself from eating it all with a spoon. Needless to say, I’ll not be buying granola anymore. This stuff is just too good and too easy. Preheat the oven to 300°. Mix all the ingredients, except for the apricots, in a large bowl. Spread the oats onto a rimmed cookie sheet and bake for 45 minutes, stirring every 10 minutes or so. Remove from oven when the oats are crisp and golden. Toss with the apricots and let cool. I also tried my hand at olive oil granola last week and was extremely pleased with the results, as my almost empty stash can attest. I love the ginger addition. The problem with homemade granola is that it doesn’t last long enough. Hard to keep the hands out of the jar! Saw your pic on TS & thought you had a pretty good reason to be officially obsessed! 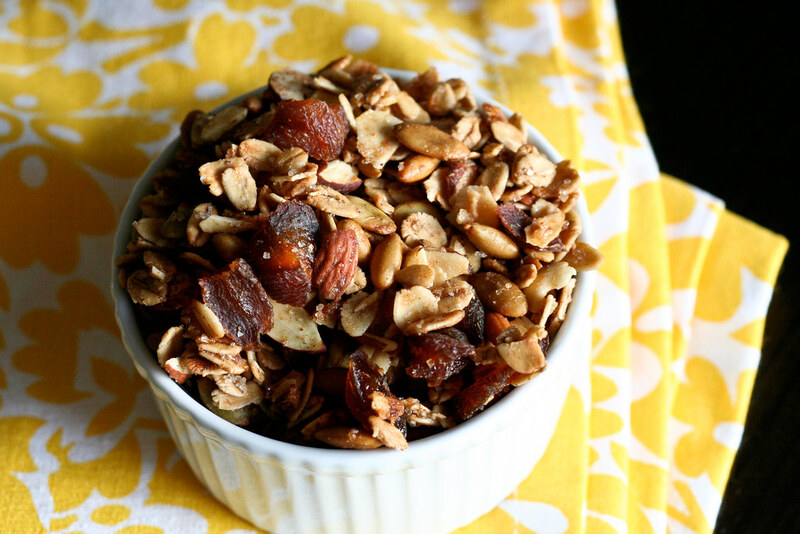 That granola looks DELISH…& can see it won’t last too long. Do you think maple syrup could be substituted by honey? This is a great post!! Ok, I will try this. My husband likes the individual yogurts with the packet of granola on top, but he feels it’s such a waste with all the fancy extra packaging (he is very “green”). He asked me to make a batch of granola to sprinkle on his yogurt. ADDICTIVE! I made some based off that recipe too (here’s the link if you’re interested). It was SO SO SO good. In fact I think I’m going to make more this weekend. I ate and shared all of mine in 1 week! What a good idea!! I love all things ginger. Thanks for sharing! Experiment with using honey instead of syrup and try mix-ins like ground flax seed. I have a feeling granola is going to be your new favorite kitchen venture. dried apricots, gag me…how about another dried fruit? rob – Pretty much any dried fruit would be good: golden or regular raisins, mango, apples… If you’re not into dried fruit at all, how about sweetened banana chips or chocolate chips or both? This is now put on my “to make” list. The only problem I’ll have is stopping myself from eating more than I should! I made this for breakfast this morning with a handful of substitutions, nut-wise, and some crystallized ginger, which I happened to have on hand. Excellent. I’d been making granola with EVO for a while, but I think the full teaspoon of salt is what does it. I’m never going back to a pinch of salt again! I finally have some time to make this, but now I have one question (and please pardon my ignorance.) What is ginger sugar? Sinead – it’s just ginger-flavored sugar, but you can make your own by mixing powdered ginger with some sugar. Crystallized ginger works well too – see here. Thanks so much, Mel! I’ll let you know how it turns out. My name is Jeff. I am to place an order with you which I hope you will be able to assist me with. I would like to order some OLIVE OIL from you. Let me know if you carry those and if you do, kindly let me know the brands and types that you have in stock and their prices.Below is some specifications on what I would like. Also advice on the additional charges on credit card use. I would be looking forward to hearing from you as soon as possible. Thank you. Pingback: Olive Oil Granola With Dried Apricots and Pistachios « the taste space – steam, bake, boil, shake! Yeah…. they definitely don’t last very well lol… don’t think i’ll make them again any time soon, I cannot stop eating them!! Thanks for sharing the recipe :) Yummy. Heutzutage kann niemand das Leben ohne Computer vorstellen. Was die Arbeit und die Studie wÃ¤re ohne sie aus?